Dates: December 20th – 28th – Join us as we transition into the new year! Early Bird Rates are $1595 and are only good until October 15th, 2011, based on double occupancy. Rates for registration from October 15th through November 15th are $1695. No new registrations will be accepted after November 15th. In the process of the retreat we will be exploring transformational acupuncture by using the Eight Extraordinary Vessels which is a Daoist approach to developing consciousness of one’s life path. Four acupuncture experiences, and complimentary lectures, will address the Original Eight Acupuncture Meridians and how they affect and reflect our physiological and psycho-emotional experience. 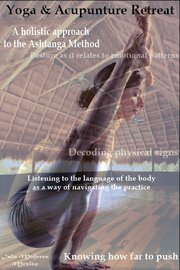 Lectures and discussions will integrate a broad understanding of meridian pathways, how they interact with the physiology of the body and the way in which they are activated, maintained, and balanced by an asana practice. Daily morning Mysore practice will be complimented with afternoon workshops that will explore the physical practice as a means to support growth and development from both Classical Yoga and Taoist perspectives. CEUs are pending for Licensed Acupuncturists! -A beautiful Mayan inspired boutique resort setting consisting of restful, airy modern rooms, private access to the beach, pool, private yoga palapa (pictured), and daily breakfast included. A devoted practitioner of Ashtanga Yoga for over a decade, Maria Villella has successfully taught yoga students from Toronto to Los Angeles how to mindfully develop their own self-practice. Maria is a teacher of Mysore Style Ashtanga Yoga, she completed her teacher training at Downward Dog Yoga Center in Toronto, Canada where she met her teacher Ron Reid. Maria continued her studies in Mysore, India under the late Patthaboi Jois and also spent time with T.K.V. Desikachar and his students at the Krishnamacharya Yoga Mandiram (KYM) in Chennai, India. In addition to her continued yogic studies, Maria is currently studying to become a practitioner of Traditional Oriental Medicine at Emperor’s College in Santa Monica, CA. In her daily classes Maria is know for her mindful approach to the self-practice of yoga. She empowers students to find their own practice while giving them the support and feedback necessary for the cultivation of internal and external alignment. Maria is a teacher at Yoga Works in Santa Monica, CA, a teacher and teacher trainer at Yoga Poser in Venice, CA, and is well know for her video work that can be found at yogiclife.com as well as frequently being highlighted in the magazine Yoga Journal. A licensed Acupuncturist and Doctor of Oriental Medicine, Dr. Yvonne Farrell has been involved in helping others to negotiate their health and find balance in their lives for 25 years. Yvonne’s passion for healing and educating is evident by the far-reaching influence she has in the Oriental Medicine community. Honed by years as a beloved Professor and Clinical Supervisor at Emperor’s College in Santa Monica, her profound insights in the fields of health and medicine are clear, detailed, and accessible. Yvonne directs her teaching towards the empowerment of students with the hope that they will gain a greater understanding of their own lives and bodies. She believes that self-cultivation & self-knowledge are essential in developing the capacity to lead a life of purpose, health, and wellbeing. To that end, she has also been on the leadership teams of many spiritual retreats and self-empowerment workshops. Dr. Farrell is the former Doctoral Degree program director at Yo San University, and a faculty member for 13 years at Emperor’s College of Traditional Oriental Medicine. Yvonne’s private practice specializes in the use of Secondary Vessels in the treatment of psychological, emotional, and physical imbalances. nice wanted to know more pl. send me the details. This retreat happened several months ago. If you would like to know more about Yoga and/or Acupuncture you can contact Maria Villella here: http://www.facebook.com/pages/Maria-Villella/114558013431.